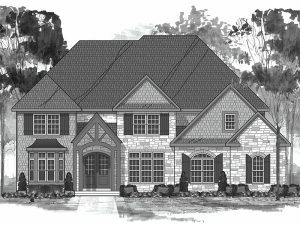 Feel free to get the conversation going with one of our award winning model home designs as inspiration for building your new home in Westlake, OH or any of the surrounding communities like Rocky River, Bay Village, Avon or Avon Lake. 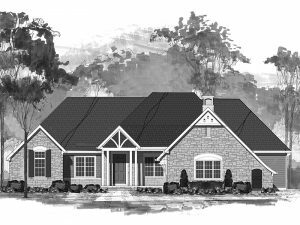 Any of our models are a great platform for getting started dreaming and designing what your new home could like on the outside. Then hop over to our Inspiration section to start getting ideas for what the interior could like. Whether you want to start completely from scratch or from a few existing ideas, our dedicated North Star team architects, designers and craftsmen are here to help bring your dream home to life! 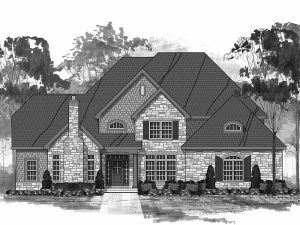 Country French design with expansive open 1st floor with custom decorative columns and arches, Amazon room, custom pantry, 3 fireplaces, homework center on 2nd floor, spacious laundry/mudroom area, board and batton wood shutters with metal roof accents on front elevations. 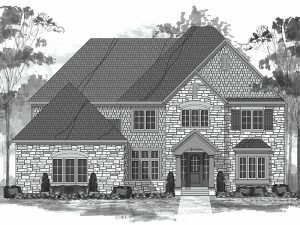 This custom home available in the Bur Oak community in Westlake, OH has a spacious master bedroom with sizable walk-in double closets accompanied by a custom tile walk-in shower, custom kitchen with morning room & hearth. 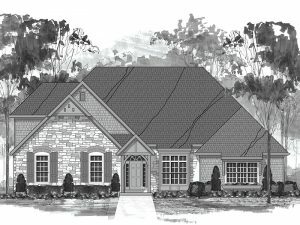 2 additional bedrooms, study, great room, dining room & 3 car garage complete the Avondale. This custom home comes equipped with a spacious master bedroom & 2 sizable walk-in closets accompanied by a gorgeous ensuite master bath. Briarwood has 2 additional bedrooms, great room, dining room, morning breakfast nook compliments a large kitchen, adjacent laundry room with half bath & 3 car garage complete this home. An optional 308 sq ft second floor with full bath is available in this model as well. This custom home comes equipped with a spacious master bedroom & 2 sizable walk-in his & her closets accompanied by a gorgeous ensuite master bath. Ellington has 3 additional bedrooms upstairs with 2 full baths & walk-in closets, great room, dining room, den, hearth room compliments a large kitchen, adjacent laundry room with mud room & 3 car garage complete this home. Outdoor patio & optional porch available. Savannah has a second floor master suite with spacious ensuite master bath & large his/hers walk-in closets. The second bedroom on the second floor has an attached bathroom, while the third & fourth bedrooms have access to a shared full bath. The large kitchen has adjacent laundry room with mud room & 3 car garage complete this home. Outdoor patio & optional porch available. This custom home comes with a first floor in-law suite, den, great room & a study. Glenmore has a second floor master suite with spacious ensuite master bath & large his/hers walk-in closets. The second bedroom on the second floor has an attached bathroom, while the third & fourth bedrooms have access to a shared full bath. The large kitchen has adjacent laundry room with mud room & 3 car garage complete this home. Outdoor patio & optional porch available. Rustic french country home with decorative gable accents, board and batten wood shutters and metal roofing accents, first floor master bedroom with trey ceiling, basement access from garage and within the home, 2 first floor fireplaces with generous 2nd floor flex space.